There seems to be no end to the creative genius found in making useful structures from PVC. 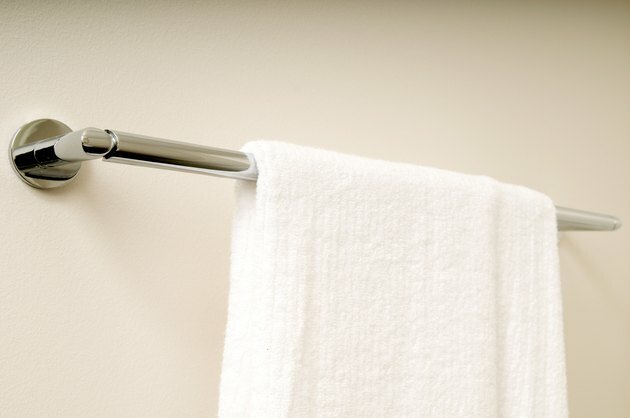 An inexpensive and lightweight towel rack can easily be fashioned from 3/4-inch pipe and an assortment of connectors. If you enjoyed Tinker Toys or Legos as a kid, you are sure to love the fitting of pieces together to form this project. This application is sturdy and free-standing and will hold several towels at once. Alter the size to best fit your needs. It works as well around the pool as in the bathroom. Cut the following sizes of the PVC: four 32-inch pieces, four 10-inch pieces, two 9-inch pieces, six 3-inch pieces and two 26-inch pieces. Insert two 10-inch sections into a T connector horizontally, leaving the stem of the T pointing upward. This forms one of the stabilizing legs to the unit. Repeat for the other leg. Add caps to the ends of the legs. Insert a 9-inch piece into the upward opening of the T. Place another T on the 9-inch pipe with the stem of the T facing inward. Do the same for the other leg. Place a 32-inch PVC pipe into the inward facing Ts. The unit should stand up now. This low crosspiece is for stability. Connect the two 26-inch pieces into the T openings at the top of the unit. Attach a four-way connector to the top end of each of the 26-inch pieces. Insert the 3-inch pieces into the four-way connector. Insert an elbow into each of the openings in the four-way connectors, openings pointing inward. Install the three remaining 32-inch pieces into the elbows. These three crosspieces will hold the towels. Determine that the towel rack has all the pieces headed in the right direction before applying adhesive. Remove joints and glue together one at the time. Wipe off excess glue immediately. Debra Taylor is a freelance writer whose career experience includes owning an interior design business and a retail frame shop. She also taught elementary school and middle school language arts and has a Bachelor of Arts degree in early childhood and elementary education from Lander University. She continues to be involved with children in an after school program.